In the early 1870s, as the underground workings of Bradford Colliery were expanding, viable seams of fireclay were discovered. In particular, it is understood that the fireclay was worked in the seams lying between the Openshaw Mine and the Charlotte Mine at a depth of about 345 yards. Consequently, the colliery manager, Edward Williams, decided to build a works for the manufacture of building bricks and fire bricks for use in lining furnaces, etc. In 1874, a large kiln of a type designed and patented by Friedrich Hoffmann was erected in the north east corner of the colliery yard, adjoining Mill Street, which was served by a railway siding and the Bradford Private Branch of the Ashton Canal. Bradford Colliery (1932), showing the Hoffmann kiln in the north-east corner. A report published in 1896 by H.M. Inspector of Mines for the Manchester District, John Gerrard, recorded that the brick works was owned by Edward Williams and that it employed five workmen, three underground and two on the surface. The fireclay workings were abandoned on the 20 July 1905 and the kiln fell into disuse. The disused kiln remained extant until the 1940s when it was demolished to facilitate an expansion of the colliery surface workings. 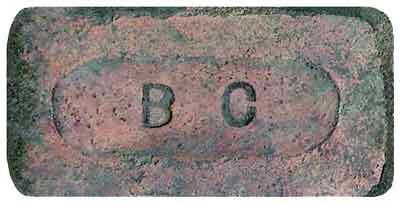 Building brick manufactured at Bradford Fire Clay Works, incised with the initials 'BC' for Bradford Colliery. 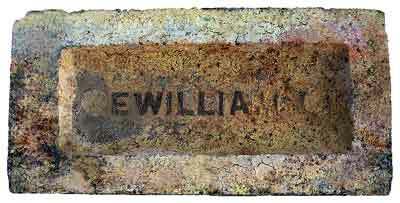 Fire brick manufactured at Bradford Fire Clay Works, incised 'E WILLIAMS', owner of Bradford Fire Clay Works. This type of rotary kiln was designed for continuous operation and it contained a number of large chambers in which bricks were fired. The kiln was an oval structure that consisted of a central flue along the axis, the walls of which were divided into 6 to 12 firing chambers along each side with dampers between them that could be opened for the fire to pass from one chamber to the next. All the chambers were connected to a chimney via the central flue. The kiln at Bradford probably had 6 chambers on each side and it was about 33-yards long by 19-yards wide. Each chamber had an outward facing opening through which the bricks were loaded and unloaded and after loading it was closed by a temporary brick wall. In use, the chambers were filled with green bricks† which were then fired successively. The heat in one chamber was not only used to fire the bricks inside it but also to preheat the as yet unfired bricks in the following chambers. In the meantime, air that was drawn in through the door of the chamber where bricks had been unloaded travelled in the opposite direction and cooled down the already fired bricks in the previous chambers. Thus the fire rotated around the kiln in a continuous process. Coal used to fire the kiln was poured into it through an arrangement of holes in the roof. The brick oxidation firing phase in the kiln ranged from around 150 to 980ºC and the vitrification phase ranged from around 870 to 1,315ºC. Finished fire bricks were comprised of about 73% silica and 15% alumina. Silica (Silicon dioxide, SiO2) has a melting point of 1,713ºC and Alumina (Aluminium oxide, Al2O3) has a melting point of 2,072ºC. †Green bricks were unfired bricks and they were made larger in size than finished bricks to allow for shrinkage during fireing.